Wineries of Northwest Michigan, the state’s premier grape growing region, have strategically combined forces for a new initiative to create a brand that best showcases the high-quality wines being grown in the area. 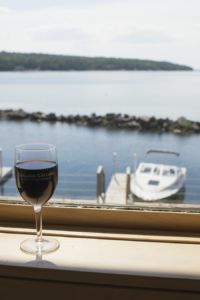 In partnership with TC Tourism, Traverse Wine Coast launched its first Traverse City Uncorked event which showcased a variety of activities across the region during the month of May, which is Michigan Wine Month. The event was a huge success in its inaugural year and will take place again in May of 2018. The objectives of Traverse Wine Coast focus on national promotion, media relations and increasing the local wine presence. While these objectives become a combined focus, both the Leelanau Peninsula Wine Trail and Wineries of Old Mission Peninsula will continue to operate on other tasks as they have in the past. The Traverse Wine Coast is home to two American Viticulture Areas (AVAs), each located on a peninsula—Leelanau Peninsula and Old Mission Peninsula—within Northwest Michigan’s premier grape growing region. Thirty-five wineries are located within diverse microclimates uniquely suited for a variety of wine grapes. Among the internationally acclaimed varietals are riesling, pinot grigio, chardonnay, pinot noir and cabernet franc. The cool-climate wines are food friendly and continue to achieve national and international accolades with each passing vintage.